Find out which of these anger management programs is best suited for your personal and individual needs. We have three different certificate programs for you to choose from, which you will find listed below. 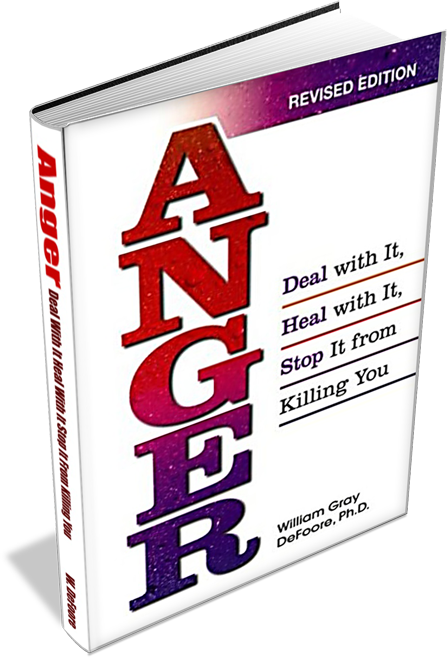 Are you ready to learn about anger programs that really work? Great--here are three of them, each suited to your needs, according to what you're looking for. When you call to schedule, we will begin designing your program for you. This is an excellent way to heal from child abuse or adult trauma of any kind. Consider it a gift to yourself. All of these anger management courses are completely private and confidential. While one on one sessions usually are not considered "classes," this is what I offer to make sure you get what you're looking for. You will meet individually with me, Dr. William DeFoore, in person or by telephone for each program. There are no groups included in any of these programs. This option is for people with mild anger management issues. If you're doing well overall, but have some anger that pops up in certain situations, then this might be all you need. If you're not sure about this, then take the Anger Management Assessment and that will help you decide. Three 50 minute sessions over a three week period. Sessions are in person or by telephone--all sessions are conducted by Dr. DeFoore. You will also receive an Anger Management book and CD at no additional charge. Homework assignments between sessions will help you reach all of your goals more quickly! You will get a signed Certificate of Completion at the end of this program. This is the choice for you if you are having serious anger issues. Take the Anger Management Assessment to know the level of your anger issues for sure. Two Anger Management books, a single CD and a four CD program. Helpful homework assignments between sessions to maximize your benefit. A signed Certificate of Completion will be yours when you finish this program. This advanced program, entitled "Transforming Anger" is for you if you have more deep-seated issues, and/or if you have uncontrolled anger, or "extreme anger issues" as defined in the Anger Management Assessment on this site. These are also the anger management classes for you if you're involved in abusive relationships. An intensive three day, 12 session program conducted on site in Denton. All sessions are led by Dr. DeFoore. Contact us using the form below for more detailed information about this program. Included with this program are two Anger Management books, two single CDs, and a four CD program. Homework assignments between sessions help to facilitate your progress and build your skills so that you get lasting results! 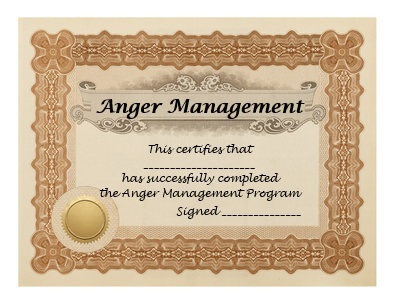 Your signed Certificate of Completion will be available at the conclusion of this anger management program. Learn what to expect from anger management programs in general. Ask Your Questions Or Register Now! Healing From Child Abuse: Many anger management problems result from child abuse of various kinds. Learn about the different types of abuse, and how you and your loved ones can heal the pain, anxiety and anger that results. You don't have to be a victim. How To Deal With Abusive Relationships: Nobody consciously chooses to be involved in abusive relationships. Whether you are being abused or being abusive, this page will help you heal the cause of the destructive behavior so that you can be the good person you truly are and create healthy loving relationships. Getting Even Without Making It Worse: Learn about healthy, non-destructive ways to get even when you're angry. What you're really going for is a feeling of resolution inside, and this is where you can learn exactly how to accomplish that. It doesn't have to mean hurting other people. Anger And Depression: Learn how suppressed anger can lead to depression, and how expressing anger in healthy ways can be a key to healing depression. These two conditions are a lot more closely related than you may think, and now you can learn to overcome both of these problems at the same time. Anger Management Activity: Here's an overview of the different types of activities you can engage in to overcome your anger issues. Reading, listening to audio programs, signing up for classes or simply journaling on your own can be extremely beneficial as you work to create a better life for yourself and your family. Marriage Counselling Stories: Read these fascinating stories from good folks like you trying to heal their marriages and find the love they once had. Also, you can get some help for your own marriage here, by submitting your own story or question.